Looks like a May release. Followup to Goemon film. Oh, I am all in for this! I definitely wasn’t expecting the next Koike film to come out so soon. We’ve been getting so much great Lupin content recently. It’s a great time to be a fan! I guess that means the likelihood of us getting a Zenigata film next is almost certain. Color me very excited for both! I was hoping this would be a Zenigata film. But I enjoy Koike's Lupin so that's a minor matter for me. I'm positively surprised that we're getting Fujiko after all. 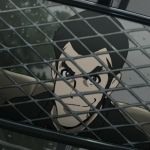 I hope Zenigata is next, and maybe one more for Lupin in which all the hints of a bigger backstory come together and connect every entry in the series. The trailer looks promising. That reminds me. Make this available for digital purchase here, too. Its story centers on Fujiko who is running away with Gene (CV: Hanba Tomoe) who has a serious heart disease. His father Randy usurped 500 million dollars from a company named Kodfrey Mining for the expense of his surgery. After Randy was forced to kill himself by Bincom (CV: Mamoru Miyano), a professional killer hired by the company, Gene has become the only person who holds the key to the missing money. Sounds okay. The trailer shows Bincam doing some super-cool stuff.